It is extremely rare to find a true black overlay glass snuff bottle, as a fine line divides what is a genuine, opaque black, and what is in reality a very dark olive-green, for instance. The present lot is one of the best examples, and only a handful of others are published (including two from the Bloch collection, illustrated by Moss, Graham, Tsang, A Treasury of Chinese Snuff Bottles, Vol. 5, Glass, nos. 962-3). 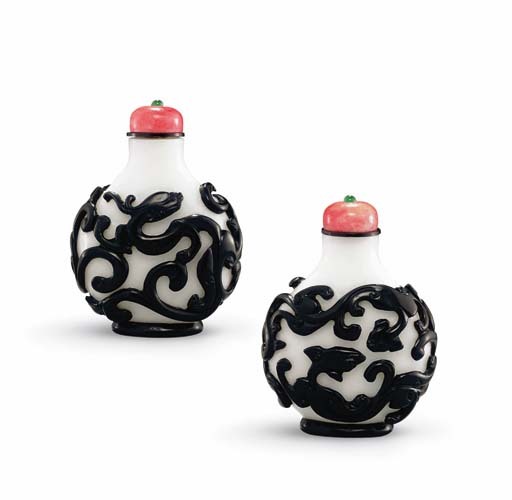 Given the intensity of the black, and the confident carving of the favored court motif of flying chi dragons, it is likely that this was made for the Court. For references to other glass overlay bottles with this subject, see under lot 631.